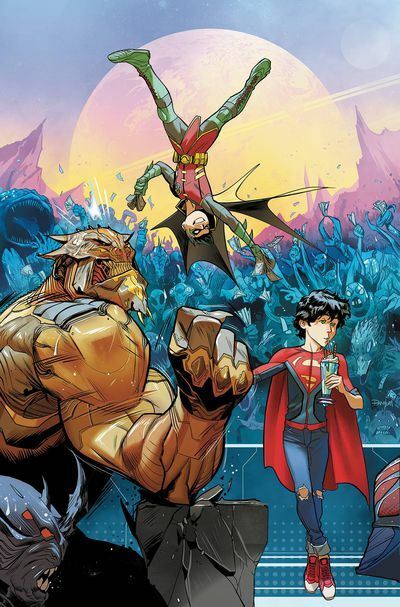 Tomasi, Barberi and Thibert keep the crazy silliness moving right along in the latest Adventures of the Super Sons. At the end of the previous issue, Superboy got split into red and blue versions. They spend as much time fighting against each other as they do battling with Rex Luthor and his mini Legion of Doom. One cannot help but feel sympathy for Damien Wayne. Robin comes off as the only adult in the room. I find myself at a bit of a loss when it comes to reviewing this issue. I can tell you how funny it is. I can tell you that the art is perfect, and adds it the overall humour. I can tell you there is a surprise cameo by…oh, no, I am not going to tell you that. Thinking about it, I guess the most impressive thing about the Super Sons series is how reliable and consistent it is. Doing a humourous book about super heroes is not easy, and remaining entertaining over a protracted run is all but impossible. And yet, for me, as the book moved from the ongoing series to this miniseries, the laughs just never stop. I find myself looking forward to every issue of this book, and putting it high on my reading list, no matter what other books are coming out those weeks. Solidly entertaining, once again. Nothing less than I have come to expect from the Super Sons.